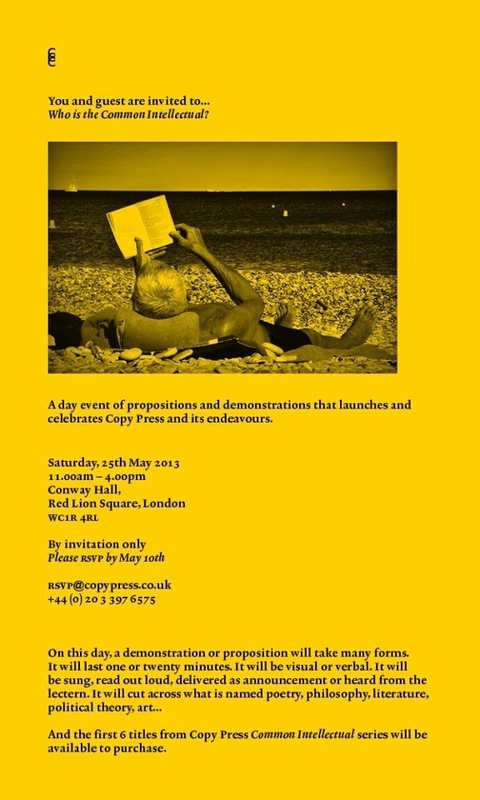 Copy Press is an independent publishing company based in London, dedicated to extending ideas of writing, pictures and readability. Currently publishing 100-page paperbacks under the series name Common Intellectual, each title provides a proposition for living, thinking and enjoyment. Copy Press publishes authors whose work endeavours to bring writers and readers into a space where common voices can come together and gather mass. This entry was posted in Books, Talks, Writing. Bookmark the permalink. ← Alienating the ‘I’ from academic writing is a big risk..